St. Dalfour Poire William Spread comes in a bottle more pretty than practical. Pears are great, aren’t they? The texture of the pear’s flesh, the skin, the moderate sweetness. They’re a great after-work snack or a pre-work mood-setter. It’s easy to find decent canned pears at the grocery store – swimming in heavy syrup from the likes of Del Monte – but good pear jam has always been harder to track down. Summerland Sweets makes a nice pear butter (stock up while in B.C. ), and I’ve had some luck at local farmers’ markets, but most pear jams I find have a mushy texture, with all the pear reduced to a granular fruit paste. Spreadable, yes, but not ideal. 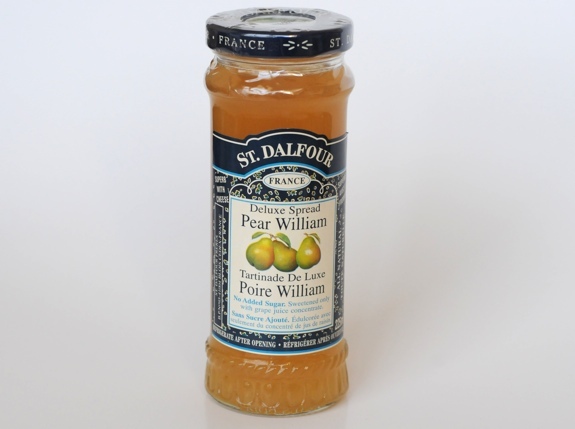 The elegant bottles of St. Dalfour Pear William Deluxe Spread yield a very pleasant surprise. Instead of a uniformly smooth baby-food texture, there are large pieces of pear intact in the jam. 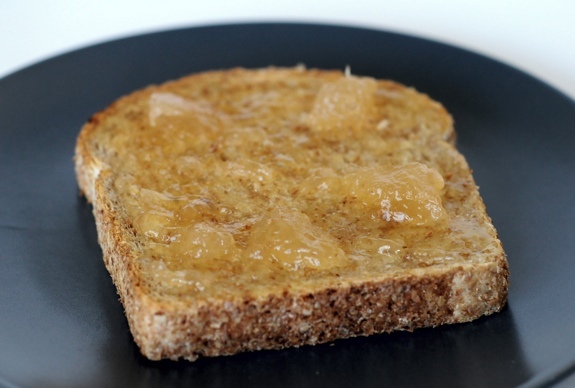 It tastes fresh and sweet, and the texture is better than that of any other pear jam I’ve had. 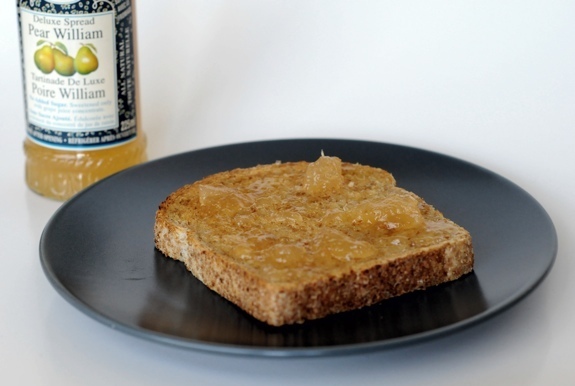 St. Dalfour Poire William Spread, as applied to a piece of buttered toast. See the chunks of pear? I’ve experimented with it over the last year or so, and I’ve found that it makes a great peanut-butter-and-jam sandwich, and it’s also wonderful on warm buttered toast. But it truly shines when you spread it on top of a warm croissant. Holy decadent, Batman. I could see adding it to a bowl of vanilla ice cream or yogurt for a flavour boost, but I haven’t tried that yet. The only thing missing is a bowl of coffee. Cost: About $5 or $6. Value for cash money: Expensive for 225 ml of jam, but it’s quality stuff. Availability: Other St. Dalfour jams easy to find at upper-end grocery stores, but the Poire William spread isn’t as ubiquitous. Nutrition? : 50 calories per tablespoon. No added sweeteners or preservatives. There are precisely four ingredients: Pears, concentrated grape juice, natural fruit pectin, and lemon juice. The label says “all natural,” and the ingredients list backs that up. Foreign mystique? : It’s from France, and it states it clearly on the label. If you want to impress guests who are over at your house for tea, put a jar of this out next to the scones. Wikipedia Factoid: The Williams pear, a.k.a. Poire William, is the same fruit we call a Bartlett pear in Canada and the States. Now you know. The verdict: I love it. 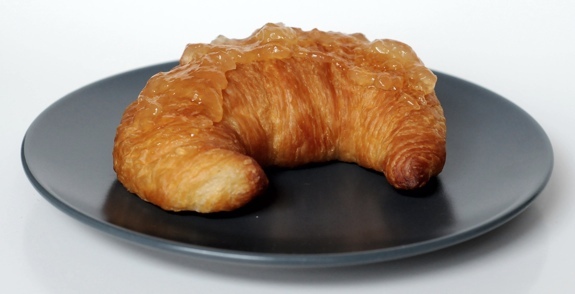 A croissant feels naked without a light coating of St. Dalfour Poire William spread. Worth keeping a bottle in the fridge at all times. St. Dalfour Poire William Spread smeared on a croissant. Breakfast just got better.